Generic die cut LaFace sleeve. 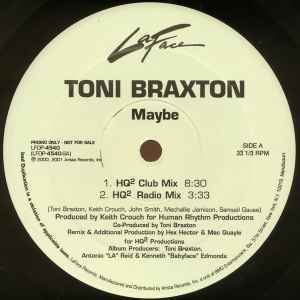 "Maybe (HQ² Club Mix)" is, without a doubt, one of my favorite club remixes ever. I was completely blindsided by it - searching for records to pull vocal samples from, I was buying up R&B and Rap promos and 12"s and thought this might be suitable. Little did I know what I was going to be in for - just a superbly danceable cut to these ears.